After finalizing the book, I flew to San Francisco to launch it to a small gathering of fellow transport experts at a new, and then still obscure conference called the Shared Use Mobility Summit (which now draws hundreds of attendees from around the world). 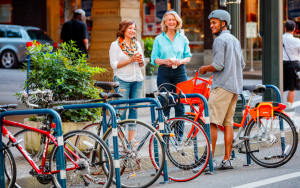 My team and I were confident int he work and thrilled to share it with the public in hopes it would markedly improve bike share systems around the world. At the conference, I met a shaggy-haired ex-transportation planner named Ryan Rzepecki, who had even bigger goals for improving bike share globally. His company, Social Bicycles, was developing a new type of bike share system with bikes that could be locked to any public bike rack or street sign, had real-time GPS to track the bicycles’ locations, and, most importantly, users were not limited to beginning and ending their trips at docking stations. He’d designed a model to solve the biggest problems with bike share: reliable dock availability, expensive equipment, and inefficient operations. For a moment I almost laughed because I had literally just written the book on bike share and I knew, as everyone else did, that bike share bikes required docking points…unless they didn’t.